A while ago I made 227 blintzes for the bar mitzvah of my friend’s twin grandsons. Because I was worried I would run out of cottage cheese, I bought 10 pounds of cottage cheese so I could make the blintzes in one big production line in a single day, and then freeze them for baking the day of the event. At the end, I had five pounds of cottage cheese left. Now I like cottage cheese, eat it for breakfast with fruit, etc. But there is a limited amount one can eat before it goes bad – and it doesn’t freeze well. I went searching for recipes that would use up cottage cheese. There were a lot of cheesecakes, but I really didn’t want to make a lot of sweets. I found this recipe at Cooking Light. I couldn’t find fat free pasta sauce that they recommended, so I used sauce with 1 gram of fat/serving – but I used non-fat cottage cheese instead of the 1% they recommended and egg substitute instead of an egg. Place cottage cheese and garlic in food processor. Process 2 minutes or until smooth. Add cream cheese, 2 tablespoons Romano, basil, pepper, and egg substitute. Process until well-blended. Spread 1/2 cup of the pasta sauce in the bottom of a 13 x 9-inch baking dish coated with cooking spray. Arrange 3 noodles over the pasta sauce; top with 1 cup cheese mixture, 1/3 cup prosciutto, and 3/4 cup pasta sauce. Repeat the layers two times, ending with noodles. Spread remaining pasta sauce over noodles. 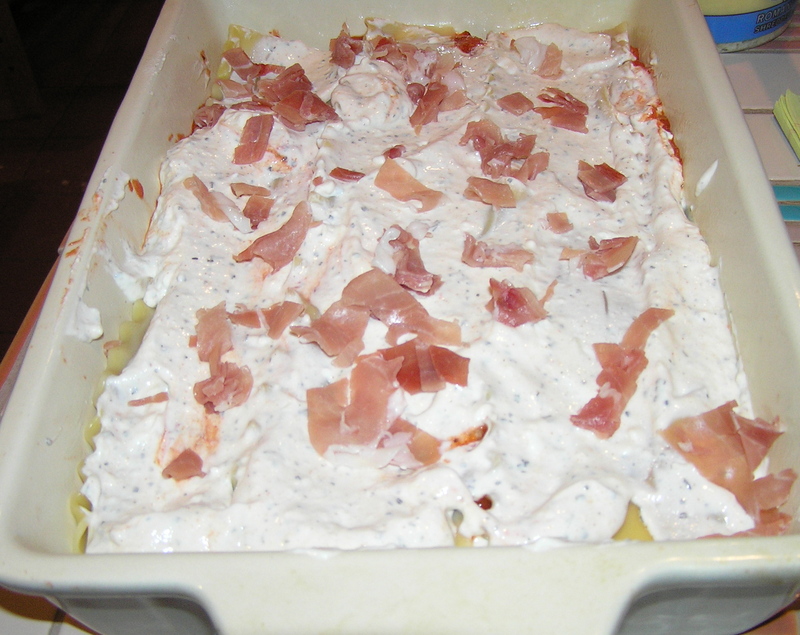 Sprinkle with 2 tablespoons Romano and mozzarella. Cover and bake at 375° for 45 minutes or until sauce is bubbly. Uncover and bake an additional 15 minutes. Let lasagna stand 5 minutes. Makes 9 servings at about 6 grams of fat/serving. 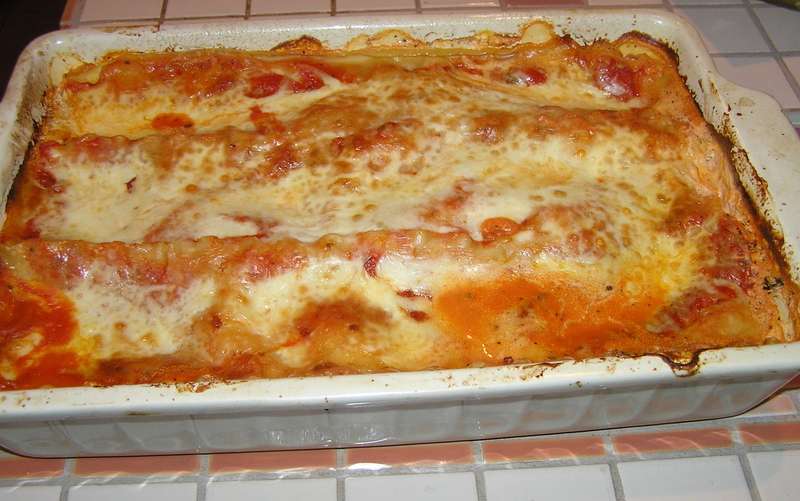 There is an additional story about this lasagna. I made it on the weekend before Thanksgiving, fully intending to eat it for an easy dinner every evening before I left early Wednesday morning for Baltimore and Thanksgiving with my daughter. When I woke up Monday morning, my refrigerator had died an ignominious death in the night. I hastily moved items that were still frozen from the top freezer to the big freezer in my pantry. The refrigerator area itself was reasonably empty because I was going to leave town. I had to get to work, so I just boxed up the refrigerated goodies that could be saved and, because it was very cold out, I tossed them onto the back deck in the snow. I figured I could find a better place for them after I got home from work. 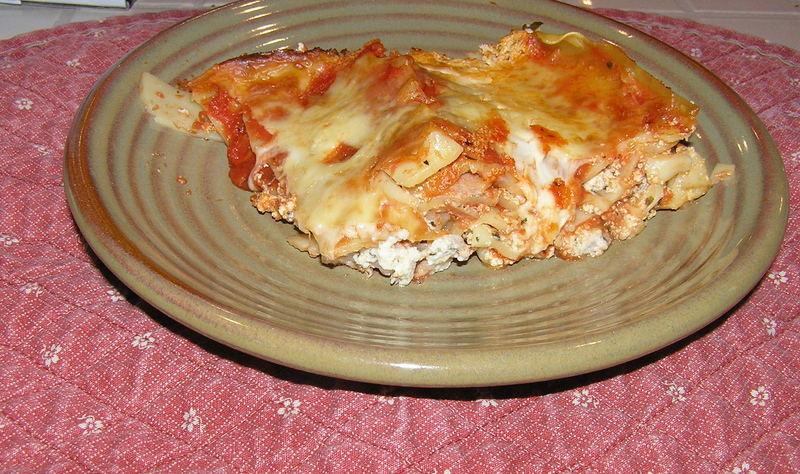 I came home grouchy, tired and very hungry – looking forward to a nice hot big piece of lasagna. But the sliding doors to the deck had frozen shut. No amount of rapping, prying, or cursing could get it open. There was glass between me and my lasagna! I was like one of those animals that they train to push a button to move the glass panel to get to its food – only I wasn’t smart enough to move the glass panel. Miserably, I found something else to eat and went to bed. (Actually, I was laughing hysterically at my ridiculous predicament by this time.) I finally got the door open the next day using an electric space heater for several hours – rescued my lasagna and other now frozen goods, tossed it all in the big freezer for better or worse, and headed out of town. Woman doth not live by plums alone – if she did, she wouldn’t still have a large bowl of plums taking up refrigerator space where she needs to put things from the grocery. There are other foods…and there are potlucks. I needed to bring a vegetarian or “dairy” (milk products only) dish to a potluck this week. Naturally, I wanted Wow Factor, and low fat on the off chance I might have to bring some home – not very likely once you see them. I have tried to make rice paper wrapped rolls before, and they always fell apart. Then I ate at a Thai restaurant where we ordered summer rolls. They were small and tightly wrapped, not the big floppy things I produced. The trick is in the tight wrapping. By the way, this is pretty much a no cooking recipe. This recipe came from Sunset magazine. I was a little surprised at some of the ingredients – Granny Smith apples and French-fried onions? But they worked and were delicious. I made a double recipe – 20 rolls or 40 halves on toothpicks. This recipe is for 10 rolls. The trick to this recipe is to prepare all of the filling ingredients and lay them out in a row on your work surface. Then it is kind of an assembly line process to put them together. Put noodles in a large bowl and cover with almost-boiling water. Let noodles sit until tender, 5 to 8 minutes. Don’t leave them longer or they’ll get too soft. Drain noodles and rinse with cold water. Spread noodles out on a baking sheet lined with a kitchen/paper towel. Pat dry. Divide noodles into 2 long “logs,” then cut each log with scissors into 5 equal portions. Set out all ingredients except the sesame sauce near a large work surface. Pour very hot tap water into a large shallow bowl such as a pie plate (I put the pie plate in the kitchen sink so it wasn’t too drippy). Submerge 1 rice-paper wrapper until moistened and softened slightly but not completely pliable (it will continue to soften as you work with it). The trick here is to dip it in the water, turn it over, and dip it again. That’s enough! Do them one at a time. Don’t try to be efficient and dip several of them. You will have a mess, and you will not get into the Zen of making nice noodle rolls. Also, unlike phyllo dough, which can be patched, broken rice papers don’t patch well. Your roll will fall apart (this us the voice of experience speaking). Lay damp wrapper on work surface – I have large flexible plastic mats that I use – and put 1/2 lettuce leaf in center. Mound 1 portion of noodles on lettuce followed by about one-tenth of the cucumber, carrot, and apple slices; 3 mint leaves; 4 cilantro leaves; and a sprinkling of onions. Arrange ingredients into a rectangle about 4 in. long. Fold paper tightly over short ends of filling, then roll up tightly from the bottom. Repeat to make remaining rolls. Serve with sesame sauce. This makes 10 rolls at less than one gram of fat/roll. These are rolls on a plate waiting to be sliced. I found that if you want to cut the rolls in half, you should let them dry for a few minutes until the wrapper is no longer slippery. This kind of firms them up. This shows the inside of the rolls, which are very colorful. I put the toothpicks in before I cut them. The platter itself included the dipping sauce below. I thought it might have a little too much of a kick, but no one thought it was too spicy. And you have to admit it all had that Wow. Whisk all ingredients together in a small bowl. You can make the sauce ahead (the noodle rolls should be eaten the day they are made. Chill airtight for up to 1 week. Makes about ¾ cup, with 1.6 grams of fat/tablespoon. Tonight is a use up the leftovers before they spoil night. The chief leftover was chicken breast remaining from a roast chicken earlier in the week. I thought I would use it for sandwiches to take for lunch, but it didn’t happen. The other main leftover was cilantro, which I used earlier in the pasta salad. One of the things that annoys me about fresh herbs is that you usually only need a tablespoon or a quarter of a cup of them, but you have to buy the whole bunch. And then the rest of the bunch rots in the refrigerator. One way to save them is to chop the herb up, measure it out by the tablespoon into ice cube trays, add water to the tray, and freeze the herb. This is ok if you plan to use the herb for flavor, but not very useful if you want to sprinkle it on as an accent. So I now have this lovely herb keeper. The herb keeper has cilantro and mint in it. The funny thing is, I bought this same herb keeper for my daughter for Christmas, and because it seemed so useful, I bought one for myself. My daughter came across the same herb keeper, and bought me one for Christmas – so now I have two of them. I guess you can’t have too many of a good thing. The original recipe for this dish came from Cooking Light, and seems to have been intended as a cold dish. It is still too nasty out for a cold dinner, so I made it into a hot dish. It is reminiscent of Pad Thai, but with a little more of a sour taste. The original recipe called for 2 tablespoons of chopped dry roasted peanuts to be added at the end, but this brought the total fat gram count up to 8 grams/serving. Since I want to take it for lunch that was a little too high. Besides, I am suffering from peanut paranoia at the moment. You can add them if you want. Cook noodles according to package directions (mine just needed to soak in boiling water). Drain the noodles and rinse under cold water; drain. Cut noodles into smaller pieces. I used a kitchen scissors for this. Set aside. Heat 2 teaspoons of the sesame oil in a large pan or wok over medium-high heat. Add ginger and garlic to pan; cook 45 seconds, stirring constantly. Remove pan from heat. Stir in remaining 1 teaspoon oil, and next 5 ingredients (through broth). Lower heat to medium low, return pan to heat, and cook for 3 minutes, stirring occasionally. Add chicken and noodles, toss to mix. Cook 3-4 minutes or until heated through. Makes 4 servings with 5.7 grams of fat/serving. Variation: I think that you could easily add some chopped cooked vegetables to this, if you have more leftovers to use up. I’ll probably do this when I take it for lunch. I also might add a little more vinegar. Luckshen Kugel is my ultimate comfort food – and these days who doesn’t need a little comfort. A Kugel, according to Wikipedia, is “any one of a wide variety of traditional baked Jewish side dishes or desserts consisting of ground or processed vegetables, fruit, or other starches combined with a thickening agent (such as oil, egg, or flour). Luckshen are egg noodles. My mother’s luckshen kugel was delicious – and very high in fat. Six or so eggs were mixed in, and I remember we kids competing to dot the top of the kugel with at least one stick of butter. My mother usually made the kugel as a side dish to go with roasted chicken or a pot roast. I often just eat a big slab of it as a main dish, take it for lunch to be reheated (which it does well, but it doesn’t freeze well), and, I confess, I sometimes even eat it for breakfast. It’s easy to make, and quite forgiving of substitutions. Preheat oven to 350 degrees. Spray a 9 x 13 cake pan with cooking spray. Cook noodles in a large pot according to package directions (don’t overcook). Drain noodles and put them back in the pot (no sense making another dish dirty). Mix apples and raisins into noodles. Mix in egg substitute and then sugar and cinnamon. Mix so that ingredients are thoroughly combined. Pour noodles into prepared pan. Cover with foil and bake for one hour. Remove foil. Bake for an additional 20 minutes until top starts to brown slightly and liquid is completely absorbed. This makes 8 large servings with about 1 gram of fat/serving. One of the few things I miss eating very low fat, especially when I am in weight-losing rather than maintenance mode, is peanut butter. Peanut butter and jelly sandwiches are one of my favorite comfort foods. I have been known to eat peanut butter straight off the spoon. It’s not that you can’t eat peanut butter – you can eat just about anything if you account for its fat grams – but at 16 grams for a 2 tablespoon serving, it takes up a good hunk of your daily grams. I did find something called Better’n Peanut Butter. It has 2 grams of fat/serving. It isn’t “better’n”, but it actually makes a decent PB&J sandwich. So I am always looking for recipes that give me the taste of peanut butter but spread the peanut butter out over several servings. I found this recipe in my daughter’s blog. She got it from cookthink, a blog I am going to explore for more recipes. It makes a good dinner side dish with perhaps a chicken breast or an Asian-style pork tenderloin. I made it to have something interesting and filling to take for lunch. A spoonful of water in the container and into the microwave – it reheats nicely. Cook noodles according to package directions and drain them. Combine all remaining ingredients except chives in a small saucepan and simmer for five minutes, whisking to dissolve peanut butter. Stir chives into sauce and simmer for another 30 seconds, then pour over noodles and toss to combine. This makes 4 servings at about 5 grams of fat/serving. Variations: If you want it to be very lemony, add another tablespoon of lemon juice. Or omit the lemon juice altogether and you will have noodles similar the sesame noodles you sometimes get in Asian restaurants. You can also sprinkle the finished udon with ¼ cup of chopped, dry-roasted peanuts, but you will need to add 4 grams of fat/serving, or 9 grams/serving total (but it’s very good this way if you have room in your gram count). Hint: To chop peanuts, measure them out and put them in a small sealable plastic bag. Pound them all over with a heavy knife handle or the bottom of a glass or cup until they are the size you’d like them.